When your profession is killing people, messily, with hand weapons, how do you reconcile that with trying to do right in the world? My father, an engineer from the Bronx who aspired to culture, first took me to a then-rare showing of The Seven Samurai when I was twelve or thirteen. It mostly went by in a blur, but some of the more vivid scenes stuck with me, indelible, embedded, and when I saw it again as an adult many years later I was amazed by how clearly I remembered parts of it. Nowadays I re-watch it about once a year, and every time—every time—new details leap out at me, touches deliberately placed by Kurosawa, each designed to reveal some aspect of the humanity of his characters: the farmers, the bandits who prey on them, and the seven samurai themselves. And I shake my head and wonder, how have I always missed that? If you’re reading this, it must be because you’re interested in the kinds of movies I post about—but maybe you’ve never seen this film, despite its reputation. Maybe you’ve been put off by the fact that it’s subtitled, or in black and white, or because it’s over three hours long, and who wants to sit through all that? Believe me: you do. With this film director Akira Kurosawa set out to create a historical epic that would be unfailingly entertaining and at the same time truthful: about its time and place, about the people who lived through it, and about how people of all times try to find the heart and courage to face up to danger and fear. And he succeeded. Technically, this film is a marvel of performance, of composition, photography, and most of all genius-level editing: long as it is, every scene moves the story relentlessly forward, and there’s not an ounce of fat on it. And the characters, so sharply drawn, so unforgettable: Takashi Shimura as Kambei, the imperturbable but warm and wise veteran who leads the samurai in their hopeless and thankless task; Toshiro Mifune as Kikuchiyo, the wild-man of no background who earns his place among the warrior caste; even the farmers, such as Bokuzen Hidari as Yohei the terrified, who has the world’s saddest face, but finds capabilities within himself he never suspected. And that’s just a few of many remarkable performances, for a film about how a society at odds with itself manages to survive that conflict needs a big cast to carry such a theme off. And that cast must come across as real people living real lives, not play-actors going through the motions. A large part of Kurosawa’s genius as a storyteller is that he loves every one of these characters, as much for their flaws as for their strengths. Much of the rest of Kurosawa’s genius is his feel for movement. 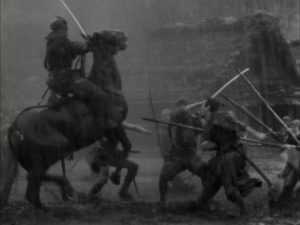 As mentioned above, every scene moves, and none more so than the amazing combat sequences, which despite being muddy, bloody, rain-drenched, and fast as hell, are marvels of cinematic clarity that are nonetheless completely convincing. Exhausting. Draining. Exalting. And horrible. Who wins? You know the story, even if you’ve seen it only in remakes, as The Magnificent Seven, or Battle Beyond the Stars, or even A Bug’s Life. The warriors fight and die, because that’s what warriors do, while the farmers, who survive to carry society on, are the winners. The farmers, and us. Next year I get to watch it again.